Posted April 28, 2018 by Todd Fendos & filed under Uncategorized. 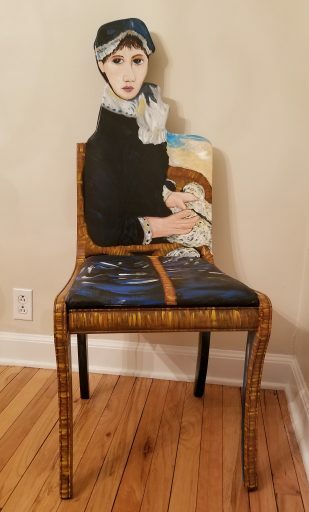 This upcycled painted chair pays tribute to Renoir’s “By the Seashore” Impressionist painting. By the Seashore is was completed in 1883 and now housed in the Metropolitan Museum of Art in New York City. Renoir made a trip to Italy in 1881-82 and was very influenced by Renaissance art. After this trip, he began to explore a new manner of painting, different from impressionism. He started to emphasize contours and modeling, abandoned the principle that scenes should be painted outdoors to capture light and atmosphere. Late in the summer of 1883, Renoir spent about a month in St. Peter Port, the capital of Guernsey, and admired the rocks, cliffs and stunning view of Moulin Huet Bay in St. Martin. He painted the starts of fifteen pictures during his stay, most of which were finished later in his Paris studio. Guernsey lies 48 km off the coast of mainland Normandy. Both share the same geology and Guernsey fulfills the “by the sea” criterion in the exhibition title. However, By the Seashore is thought to have been painted in the artist’s studio. The beach depicted here is probably not in the Channel Islands but near Dieppe, on the Normandy coast. The model was Aline Charigot, his then girlfriend, whom he married in 1890. The arc of the sitter’s dark eyebrows and saucily tilted nose in that pleasant, rosy-cheeked face are common to works by Renoir. I love the idea of the young woman’s posture by off to the side. It makes for a striking image. Thanks, as always, for supporting artists. Looking to Host a Painting Party? Let’s Talk!